The Drawmer SP2120 Speaker Protector offers both strict level control and tremendous peace of mind to the contractor, installer and venue in the knowledge that, as its name suggests, the 1U, two channel processor eliminates the possibility of ’unauthorised’ excessive sound pressure levels on speaker systems (as caused by spikes and pops in the system, or by over-enthusiast djs/engineers) which could result in damage to both chassis drivers and amplifier electronics. In addition only the maintenance engineer and the venue manager hold a key. The unit also gives a wide variety of venues, such as clubs, theatres, pubs, schools, universities etc. the opportunity to comply with the local legislation regarding noise levels. Takes only minutes to install. Dual 16 segment Left/Right bargraphs for ’at a glance’ level metering. ’Protection’ processing 16 segment bargraph display. No sound quality loss even during heavy protection processing. Once installed and calibrated completely eliminates the possibility of ’unauthorised’ volume levels. Eliminates sound system abuse and the resulting cost of chassis speaker re-cones, HF diaphragm replacements and amplifier repairs. Reduces ’call-out’ costs of sound system service/repair engineers. Reduces sound system ’down time’ and the consequential loss of venue income. The SP2120 front panel features an integral security lock to ensure that adjustments to maximum volume levels are implemented by key holders only. In ’unlocked’ mode two front panel pre-sets are exposed and available for adjustment by the installer. The first calibrates the 16 segment Left/Right bargraphs to the incoming audio and dictates the point at which ’protection’ processing commences. The second sets the absolute volume level to which the sound system is allowed to perform. If the SP2120 receives increased signal levels, the transparent ’protection’ circuitry is activated which maintains the specified system volume level without degradation in sound quality. 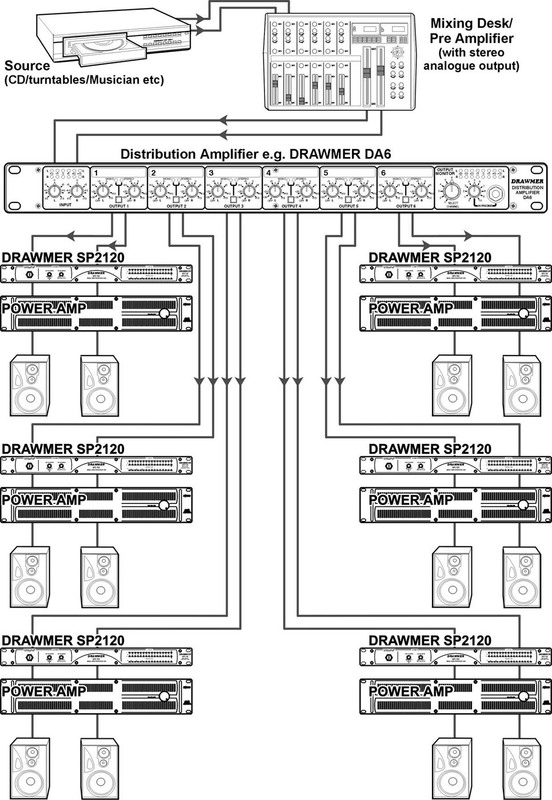 The SP2120 greatly benefits from Drawmer’s 25 years experience in designing industry standard dynamic processing devices. Its signal path combines a mixture of ’multiple time constant’ circuitry and automatic gain control (AGC) which allow small overloads to sound louder – even though they’re not. Its concept and development was encouraged by Drawmer distributors and installers dissatisfied with other protection systems currently available. These often take the form of a crude switch, either turning off the power or disconnecting the speakers, both of which are ’disruptive’ in any event.